Fundraising for Charity has never been so easy! We know what it takes to execute a successful fundraiser. We believe that by supporting each other and working together; we can nurture happy, healthy relationships and build strong, successful communities. If you have a charity you are passionate about, we would love to partner with you to support your cause. 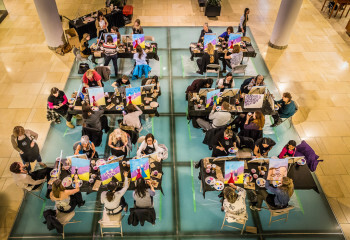 Paint and sip is a fun, new way to raise money for your cause. 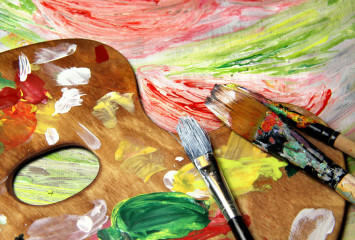 Some of the themes that we are particularly excited about are ‘paint your pet’ and ‘wine glass painting’. *There are minimum requirements for closing the studio to the public for fundraising events. Please refer to our “Private Events” literature for more information. See what people say about Fundraising for charity with us. The studio/cafe provides a space for lifting your spirits after a challenging day at work or home; inspiring you to be a little creative; giving you a fun way to get together; a new way to celebrate special occasions; or building strong teams; all the while supporting women, children and women entrepreneurs through our ‘giving’ and ‘fundraising for charity’ programs. Click the image to download a copy of our fundraiser flyer (PDF).